With Parks Week starting on Monday 9th March this week’s photo is from Ku-ring-gai Chase National Park, just 25km from the centre of Sydney. Covering 15,000 hectares the park offers both bush and water-based activities as it surrounds Cowan Water (a tributary of the Hawkesbury River) and edges Pittwater. This image is taken above the waterfall in Refuge Bay. You can walk in from West Head Road or come by boat and climb up from the small beach below. The beach is tidal and completely disappears at high tide, so if you come by kayak or small runabout, make sure you secure your craft before climbing the hill. You can hire kayaks and tinnies for exploring or fishing from Cottage Point Kiosk, where you can also get a coffee and delicious light meal. Children will love the displays of stuffed animals at Kalkari discovery Centre near Bobbin Head, where there is a stroller-friendly walk through the bush. Bobbin Head has a mangrove boardwalk, large picnic areas and a huge playground along with a couple of cafes. Hope you can explore a national park near you soon. 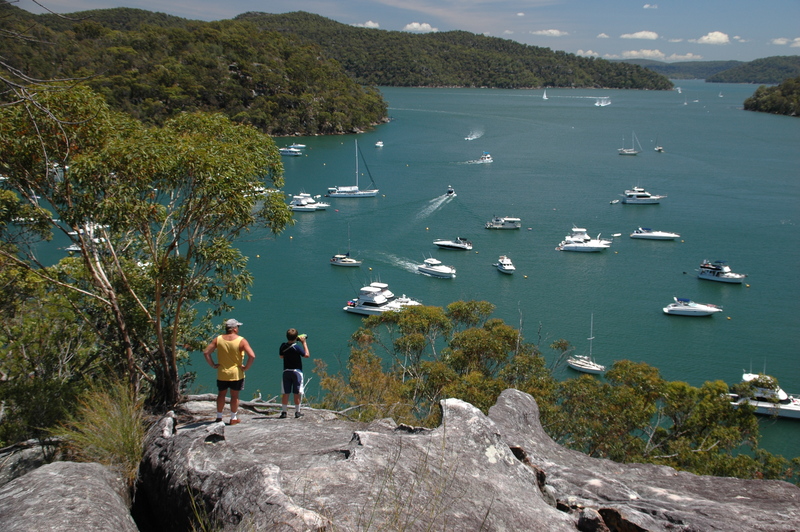 This entry was posted in Australia, National Parks, Postcards, Travel and tagged boating, family fun, hiking, kayaking, Ku-ring-gai Chase National Park, national parks, New South Wales, Refuge Bay. Bookmark the permalink.